If you have dark underarm skin…here is a tip for you! Shaving and rubbing against rough fabrics (like winter wools) create friction, and that leads to inflammation and brown or grayish patches. 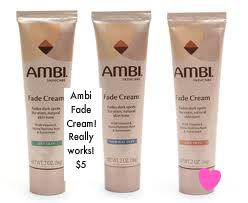 Try using AMBI or any lotion that contains hydroquinone and also use a new razor every 3 shaves! Purchase for $5-$6 at any local retail that has a cosmetic section! « A Little Olive Oil Goes A Long Way!